Each time a new Thor trailer cuts through the internet, the distance between it and it's fellow competitors for this years 'Comic Movie' crown, get further and futher apart. 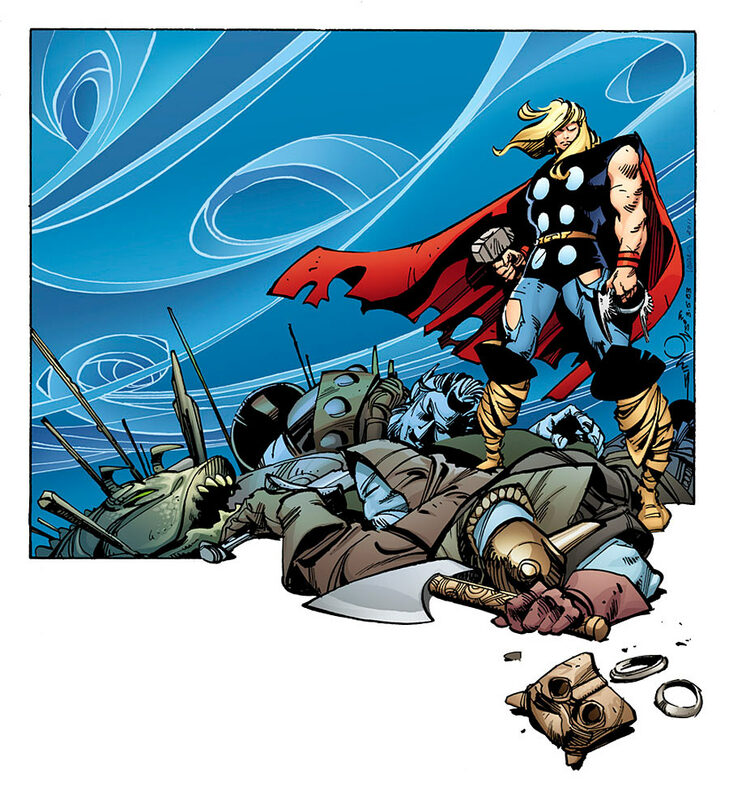 Today, as the news that Walter Simsonson is providing this variant for February's The Mighty Thor #1 struck, the following trailer hit with more Thor, more Destroyer and more mythology. That gap between Thor and the others? It's now wide enough to park Australia in. See for yourself. wow! that looks great! thanks for bringing that to our attention Dan. i sure hope this is the next Iron Man and not the next not so Fantastic Four. still leery about Green Lantern but i'm trying to keep an open mind. did i ever talk about TRON on this blog yet? the special effects were great of course and the story was quite good up until finds his father for which things started getting convoluted. the movie never really did quite bounce back from that so what you ended up with was an over all ok film. i think it's worth a second look when it comes out on DVD however. but i have to say being able to see that cover of ROM#26 on the big screen was pretty cool especially since it was much more noticeable then on the youtube trailer. This...looks...AWESOME! I cannot wait to go see this! I WILL see this in the theater. I WILL be getting a babysitter! Oh my goodness. Oh my goodness. I'm hyperventilating. I need to go dunk my head in ice water. Thanks for the comments folks!I'm already pretty set this will rock the casbah, but hey who am I to pre-judge? Let the babysitter take care of the kids and watch it in New Zealand with my usual band of misfits and I Random - we have great movie theatres here and sheep! Everyone likes sheep. did you mean to say cheap Dan? as in not very expensive? cause in American English "sheep" are those four legged animals that people raise for their wool and to make good meat dishes out off. now as for what you guys in New Zealand might be doing with them in theaters is another matter. but i'm not here to judge bro. i really hope you guys enjoy watching THOR just the same. look Dan, a bunch of kiwi guys in a car on their way to the movies with sheeps but no chicks and rave music. i'm not here to judge, you just might want to make sure your all in compliance with the law as it is in the NZ. Wouldn't sheep make a lot of noise in the movie theater? I don't want a lot of distractions when I'm watching Thor...all the blond hair..and muscles..and..and...ummm...what was I saying? Oh! Sheep. They have laws about sheep in NZ? Do they have rights? Apparently they should if guys can drive them about all willy nilly to the movie theaters. all this gives new meaning to the concept of a petting zoo. more like a heavy petting zoo. Okay, at this point I feel that someone should stick up for Dan...but as the sheep can't speak yet because science has not yet reached that pinnacle of genetic engineering all I have to say is "Baaaah!" this is normal guy stuff Randomnerd. it's kinda like how guys won't hug each other when their sober but when they get drunk it's all this "i lvu ya bro" jive. but just to be clear i'm talking strictly platonic here. Yes, we all knew that, but I'm sure your sheep are happy to have the relationship dynamics cleared up. And I'll have to look for that movie. In america sheep talks "Baaa"? In Portugal they do "méééé". I've been laughing out of my chair on you sheep posting. Oh and Thor... I'm in. Hmmm...wonder what sound Dan makes in Portugal? And yeah Aliera, Thor...I am so in there with you. wow, take a day or two off and everything goes to hell. I saw about the quake on the news this morning and though of you right away....okay so you're the only person I know in NZ. I like this movie more with every trailer. I just wish we'd get to see a bit more of Cap's movie too. Thanks Craig - I think I might actually do a post on the earthquake myself just incase any casual readers are interested or concerned by what's going down. Appreciate your concern - that's really cool to read aye.